You’ve probably heard of cold brewed coffee if you live in a bit more of an urban area or hang out in a lot of coffee shops. It’s become popular recently although there are only a few coffee shops serving it in Raleigh that I know of. Not to be confused with iced coffee which is brewed hot and then chilled, cold brewed coffee is steeped in chilled or room temperature water for many hours. In general, heat speeds up chemical reactions so hot brewed coffee leeches the flavor and properties of the coffee bean very fast. By using lower temperatures for a longer time we can produce a smoother, less acidic beverage. This is fantastic for me because I have acid reflux and drinking regular coffee every day doesn’t agree with me. With cold brew I can still get my coffee fix and it’s much gentler on my stomach. Buying a cup in a coffee shop can run you several dollars, but on a grad student salary that is an uncommon luxury. 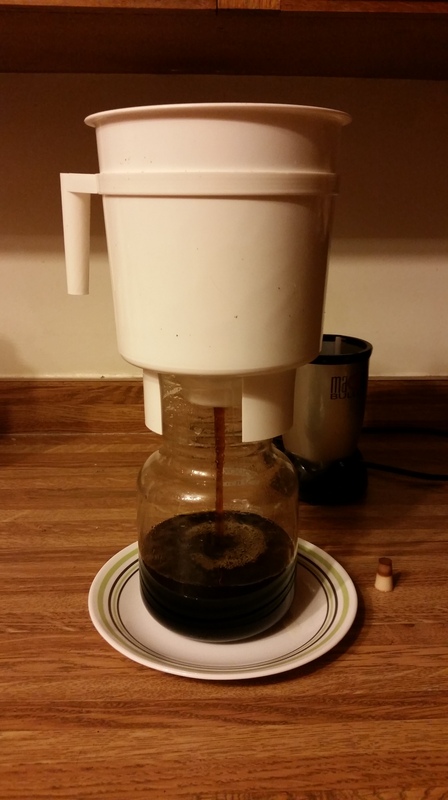 Here’s how to make your own cold brew concentrate at home that you can then dilute with cold or hot water depending on your preference. I often drink it cold and use almond milk to dilute it for a deliciously smooth drink. We use the Toddy Cold Brew System which we got on Amazon for around $30 I think. You could rig up your own setup easily too. 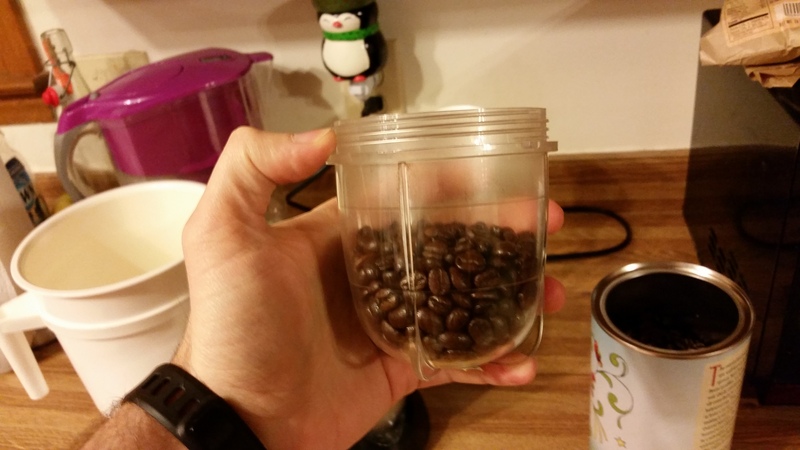 All you need is a coffee grinder, a container around 2 quarts for brewing, a filter to drain our the coffee grinds after brewing and another container to drain the coffee into. 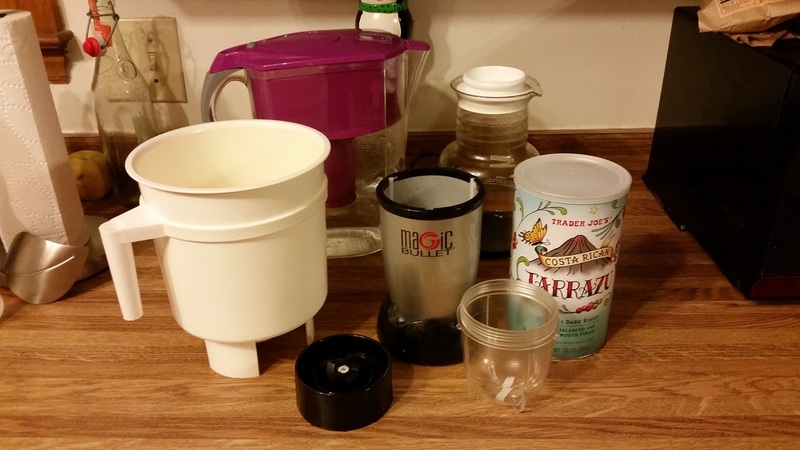 The Toddy system is convenient because the brewing pitcher has reusable fabric filters and a drain plug on the bottom. They recommend replacing the filter every 4 brews or so but by rinsing the filter well after each brew and allowing it to dry I’ve made them last indefinitely. After placing the filter in the bottom (and making sure the cork is securely in place!) 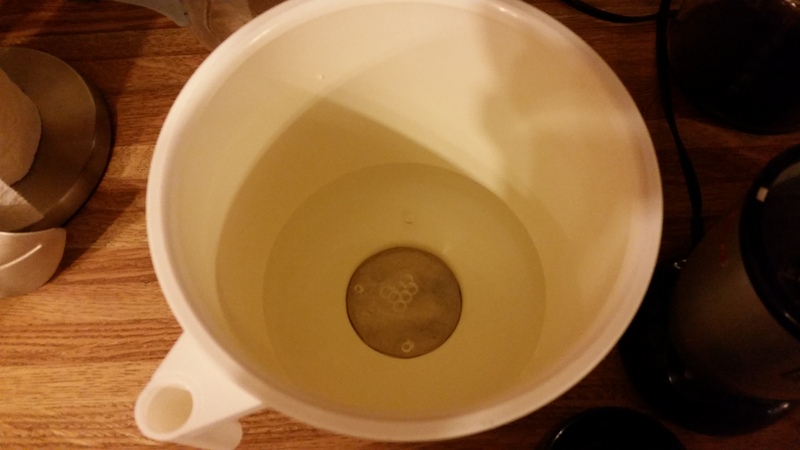 Poor about 2 inches (5 cm) of water into the container. 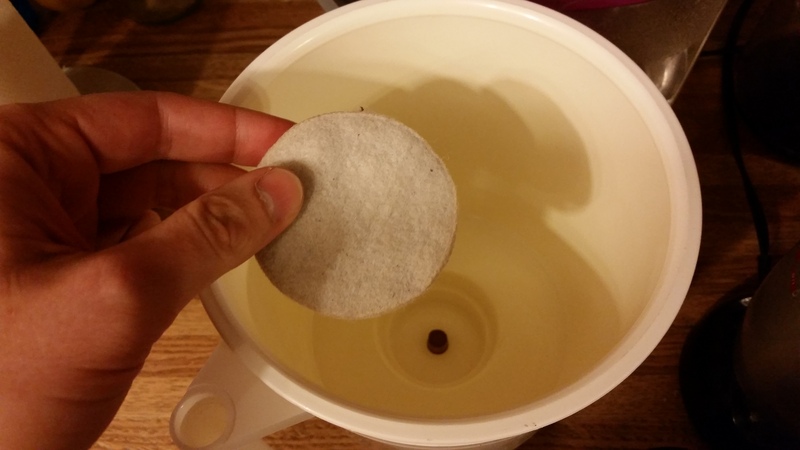 This is important because the coffee will float near the top of the water instead of resting on the filter which makes the draining process very slow. As poor college students, we haven’t gone out and bought a coffee grinder since we already had a Magic Bullet. This works reasonable well for grinding the coffee. Cold brew requires a coarse grind so it’s important to buy whole bean coffee and grind it yourself. If you happen to be using a Magic Bullet too then fill the smaller container about halfway full and use the grinder attachment with the two flat blades for best results. 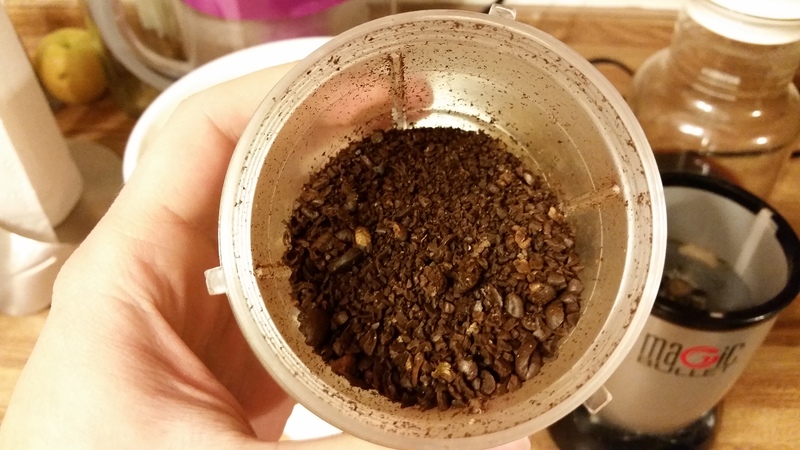 Grind and dump about half a can of coffee into the brewing pitcher on top of the water. Then pour water over top of the coffee to saturate it all with water. Pour slowly and be sure to wet all of the coffee. Now let the coffee brew. 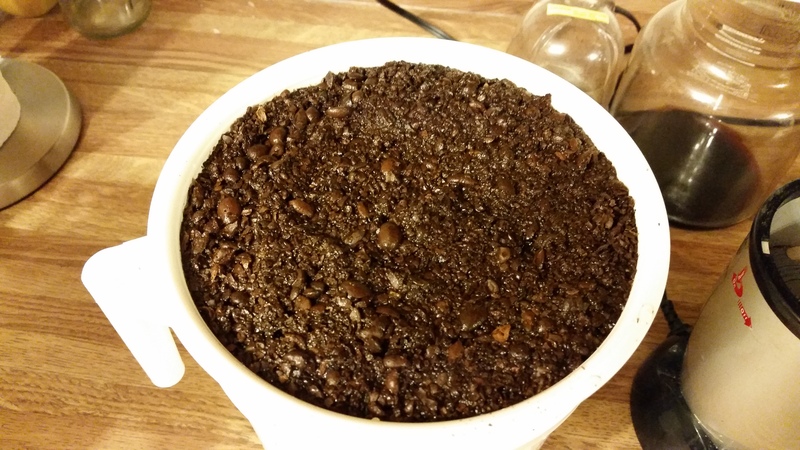 I typically let it sit at room temperature for 12-13 hours before draining. I’ve been meaning to try refrigerating it and trying longer brew times but I haven’t gotten around to it. Obviously the longer it brews the stronger (and more acidic) it will be. Experiment and find your sweet spot. Most people recommend brewing between 12 and 18 hours. 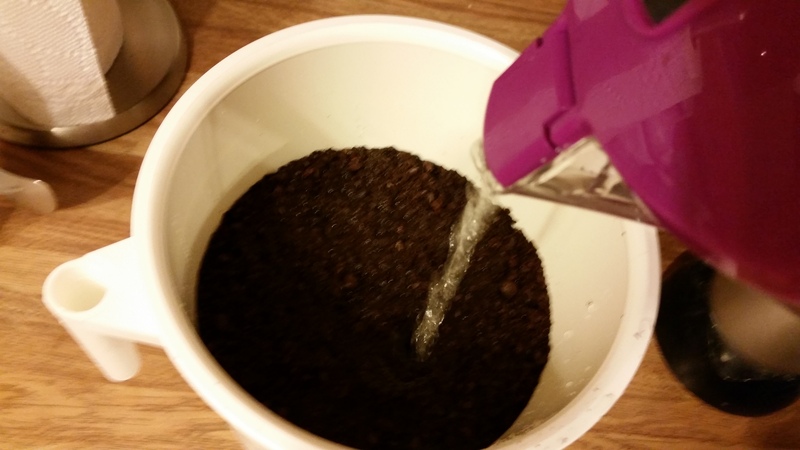 After you finish brewing, drain the coffee into another pitcher to remove all the coffee grounds. Cold brew coffee will last a couple weeks in the fridge. We usually go through a pitcher/week with two of us drinking it. Remember this is a concentrate! Dilute the coffee before drinking unless you need a serious caffeine infusion. I usually do 1/2 cup of the concentrate and 1 cup of a diluent, either water or almond milk. If I want a smaller cup then 1/3 cup to 2/3 cups is a good ratio for me but you can experiment to find your sweet spot. Mmmm! I wasn’t able to enjoy coffee for so long because it would bother my stomach. 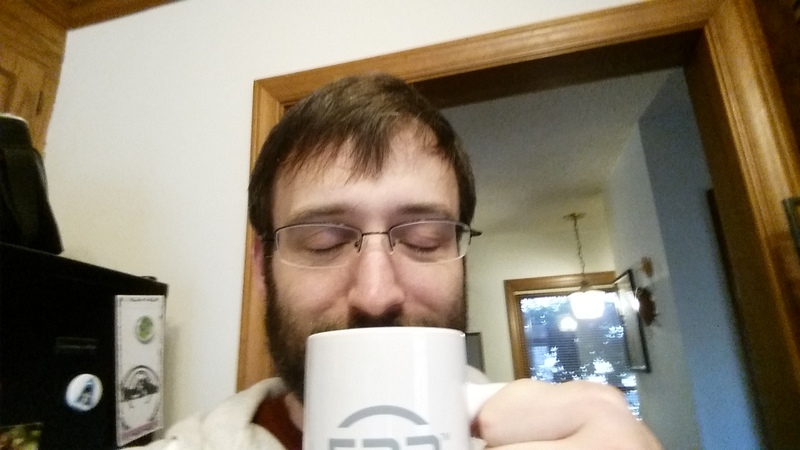 Now it’s one of my favorite parts of waking up!